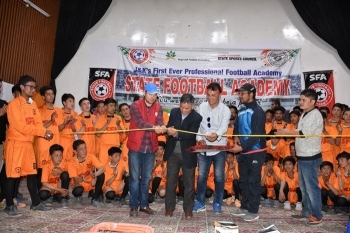 To provide training to the local football players under the guidance of professional coaches, the State Football Academy (SFA) was formally launched on May 17 in Kargil. Tashi Tundup, Chief Planning Officer, Kargil was the chief guest on the occasion while Muhammad Ali Tak, District Cultural Officer, Kargil was the guest of honor. Coaches of the SFA conducted a trial of players Under 13, 16 and 18 categories at Khree Sultan Chow Sports Stadium Kargil. Out of 300 players, 60 were selected. The players will compete in Leh for the inter-district trials. The players who will be selected after the inter-district contest will be taken to Srinagar for further competitions. Hailing the efforts of J&K Sports Council for opening State Football Academy unit in the district, the speakers termed it as a landmark event which will go a long way in giving impetus to professional sporting activities in the district. Javed Ahmad, Chief Football Coach from State Sports Council, Muzammil Mehmood, Football Coach, Ghulam Mustafa, Coordinator State Football Academy, Kargil besides the selected players were also present on the occasion.